A screenshot is a graphic that contains all or part of the computer's screen contents. You might want to take screenshots, for example, to explain how web sites or software applications work. We explain how in a tutorial: How To Make Screenshots. Snagit is one of the most powerful, and probably market-leading programs, for taking screenshots. It is especially popular with technical authors, such as writers of software manuals. I don't think you can get this program separately - it's included with CorelDRAW Graphics Suite (and Corel DESIGNER Technical Suite). 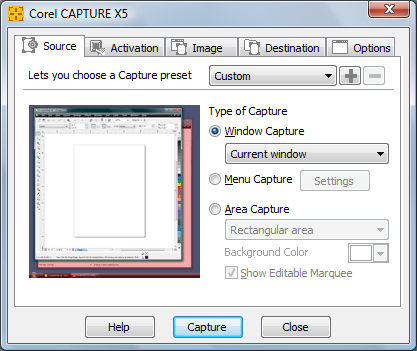 It's a handy utility taking screenshots, including quickly capturing individual windows, dropdown menus, areas of the screen (including non-rectangular areas), etc. This is not really a general purpose program for taking screenshots. But it's handy for a very specific task: quickly taking screenshots and printing them out.